“Hail the Gallant Rosey Posey,” to the tune of “Glory Glory Hallelujah.” Not the most masculine of football chants, you might think, but it was sung with great gusto at Prestonfield Park on Saturday during the Scottish Cup Second Round Replay tie between Linlithgow Rose (the home side) and Deveronvale, who hail from sunny Banff in Aberdeenshire. Before the match kicked off and having paid my eight quid to get in, I had a bit of a wander around the ground and was quite impressed with what I saw. Prestonfield is a compact, well-looked-after venue with a miniature stand combined with dressing rooms at one side (they genuinely reek of Deep Heat), and a good-sized old-fashioned enclosure at the other. The two ends were largely open to the elements, with one end being a grass bank where some Banff-based kids played football amongst themselves for most of the afternoon. The Social Club End at Prestonfield with various banners in tow, including that unique chant. Having sampled the local Bovril (a pie was out of the question as I’d had three fillings earlier on Saturday afternoon), it was time for kick-off. A replay had come about in this second round match following a 2-2 draw a week previously in Banff. 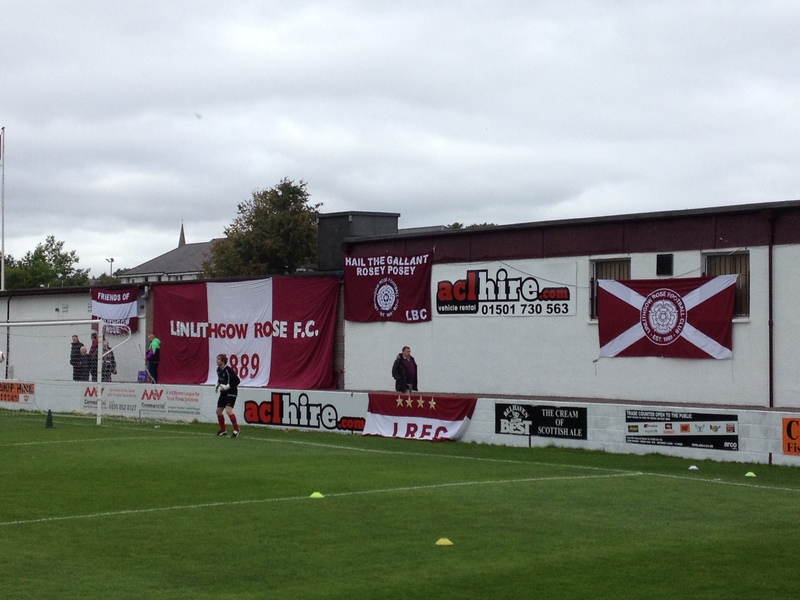 Rose were pegged back in the last ten minutes of that one by their Highland League opponents, having led 2-0 for much of the game. Kick-off at Prestonfield. The Davie Roy Stand sits opposite the enclosure. “Lithgae” got off to another fast start on Saturday, taking the lead after only 5 minutes. Midfield enforcer Steve Meechan managed to find Calum Smith on the right edge of the area, who drilled the ball low past the despairing and slightly hipster-looking Vale `keeper. 1-0 to the Rose. Much of the next twenty minutes or so was punctuated by clattering tackles and fouls by Deveronvale players which went largely unpunished by the referee, who in the meantime gave a couple of soft yellows to Rose players, Meechan included. Having controlled much of the opening quarter of the match without creating anything hugely clear-cut after the opening goal, Linlithgow conceded the equaliser on 26 minutes. A failure from Rose to clear their lines eventually saw the ball drop to Craig Cowie who caught the ball on the volley six yards out with the goalmouth open and inviting. Both sides went close before half-time, with Rose’s Gibson unlucky to see his header from a corner strike the stanchion. Half-time arrived with the match nicely poised and no lack of skill on display. Rose were good on the ball and happy to play it out from the back, while Vale seemed content to hit their opponents both literally and on the counter. The break also saw the half-time draw results marched round on a chalkboard by a willing club official, which was a lovely throwback to the more innocent days of the beautiful game. The half time draw chalkboard, with appropriate 70s-esque filter added. The second half started much like the first did, with Rose dominating. However for all the bombardment of Deveronvale’s goal, with Meechan and the impressive-till-he-got-knackered Roddy MacLennan coming close, there was no way through for Lithgae. As it was, they were undone by the simplest of set pieces in the 75th minute, with potential World’s Strongest Man contestant and Vale centre half Scott Fraser rising unmarked from a corner for the away side to head them into the lead, much to the utter delight of the travelling support from Banffshire. Five minutes later it was all over, and again the man in the middle had a part to play. From where I was in the enclosure I couldn’t see much, but it appeared at the time that the referee had given Deveronvale a penalty with their player lying prostrate outside the box. From the excellent YouTube coverage provided by the SFA (see below), it appears that Rose sub Gordon Herd, who had only been on the park for five minutes, collided quite clumsily but probably accidentally with Vale’s Graeme Rodger just outside the area. A penalty was awarded, Herd was inexplicably sent off, and Martin Charlesworth, having had his spot-kick initially saved by Rose `keeper Scott Christie, tucked home the rebound. 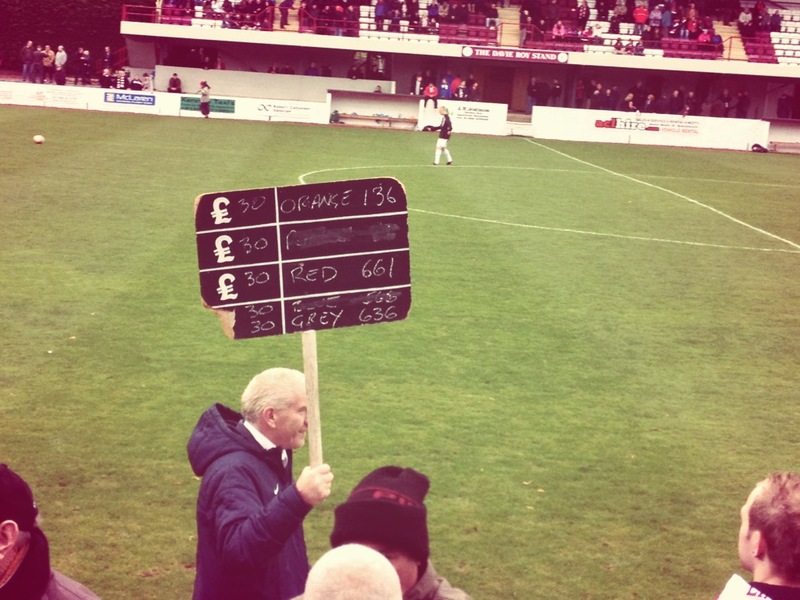 3-1, and to say the referee was a popular man in Lithgae would be a lie. To say the referee knew what he was doing would be a slightly bigger lie. The match rather petered out after the penalty went in, though Rose’s forward Tommy Coyne in particular put in no little effort trying to find a way back into the match for his side. As it is, Linlithgow will have to wait at least another year before Scottish Cup football returns to this bastion of the junior game in Scotland.